Hillview College’s Navin Bidaisee plays a shot during a Powergen Intercol T20 tournament match against Trinity College East, at Honeymoon Park, Tunapuna,yesterday. LEONARDO Francis and Kirstan Kallicharan both scored 91 not out to lead Vishnu Boys’ Hindu College and Hillview College to victories in round two of the PowerGen Intercol T20 tournament, yesterday. 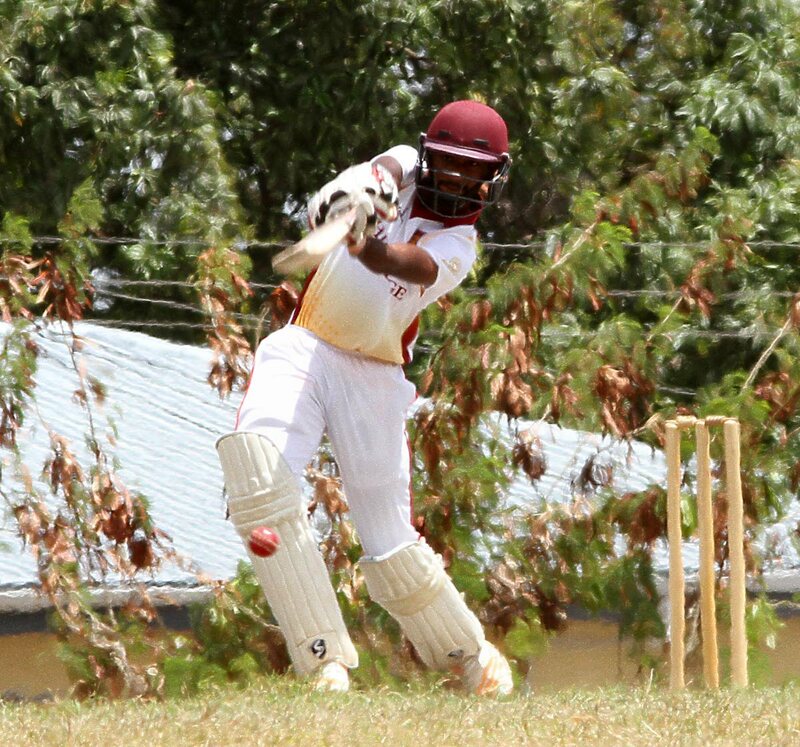 At the Munroe Road Recreation Ground, in Cunupia, national youth cricketer Francis slammed an unbeaten 91 and Rajeev Ramnath pitched in with 18 not out to guide Vishnu Boys to 149 for four in 20 overs against St Mary’s College. Bowling for St Mary’s Abdur-Rahmaan Juman took 2/21 to help limit Vishnu. In reply, Shiva Sankar was the top bowler for Vishnu grabbing 3/24 to help dismiss St Mary’s for 103. Giovanni Gajadhar (2/3) and Sameer Ali (2/19) were also among the wickets to help Vishnu to the 46-run win. At Honeymoon Park, in Tunapuna, former West Indies Under-19 player Kallicharan also cracked 91 not out to propel defending champions Hillview to 224/4 in 20 overs against Trinity College East. Leonardo Julien, playing against his former school, also helped Hillview to the total scoring 82 and captain Navin Bidaisee added 24. Trinity East batted the 20 overs, but could only manage 110/5 with Jonathan Bhim belting 33 and Sian Hackett getting 29. The quarterfinals will be played on April 4 and 5. Reply to "Francis, Kallicharan star in round two Intercol T20s"